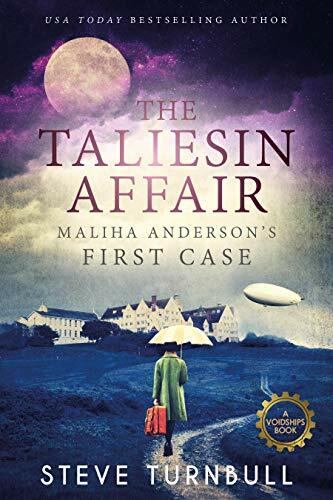 The Taliesin Affair is an interesting book, a mix of whodunnit, social history and steampunk, a genre I haven’t read before. I wasn’t convinced at first. The main protagonist, Maliha Anderson, seemed a remote and cold figure, which didn’t bode well when she was the driving force of the plot. But as the story progressed, I began to respect her more. She is of mixed race, with a daily struggle against prejudice and snobbery, and that had given her a hard shell to protect herself. She is also highly intelligent. We see the thoughts going through her head as she tries to unravel the mystery of the body in the library. The victim is a bully who has given Mahila grief in the past, so she isn’t sad about her demise. This is understandable, but Mahila seems unable to show any emotion at all, which led me to believe maybe I had missed a crucial part of her character. She is ably assisted by a much warmer friend, Margaret, inexplicably known as Sadie, who smoothes Mahila’s path through the social minefield. There is always a danger when major characters have code names and suchlike, as it makes a complex plot sometimes harder to follow. It helps that Margaret (Sadie) has to be reminded from time to time that she is working undercover. She’s a perfect foil to the serious Mahila, and provides a welcome lightness of tone. There is a subtle humour running through the book, so subtle sometimes I wondered if I was imagining it. As a whodunnit, with definite Agatha Christie undertones and a social commentary, it is an excellent read. Glad to see the women taking charge for a change, and for the author not to fall into the trap of so many stories about privileged boarding schools. I couldn’t find a single overdone stereotype. Mahila’s interest in machinery was an intriguing element as well, and could have been used more in relation to the plot, rather than just providing interesting scenery. So although I found the main character hard to identify with, The Taliesin Affair was an enjoyable and ambitious read, and an interesting addition to the crime genre. Worth noting the lesbian romance running in the background, handled with grace and dignity. So far from her home in India, Maliha Anderson did not enjoy life in her British boarding school, but discovering the school bully murdered certainly made it more interesting. And when the police chose the wrong person as the most likely suspect, Maliha decides to investigate and reveal the true culprit. But, as the bodies mount up, the murder becomes a plot, and the plot becomes a conspiracy aimed at the heart of the British Empire. When Maliha herself comes under suspicion, she realises her only chance lies in a dangerous gambit that risks the lives of herself and the people she’s come to know. This is Maliha Anderson’s first case but can be read at any point in the series (except perhaps between books 5 and 6).